Next of the product line of the floating vehicles is Viking 2992. 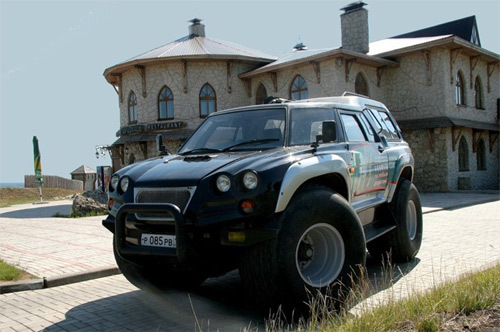 This vehicle was created as the answer to Trekol, which is by its nature especially the utility offroad vehicle. Viking 2992 is on the other hand designed as a passenger vehicle for case of nuclear war, or another apocalyptic scenario, when routes or roads do not exist anymore. Viking is a SUV of monstrous size. It offers 7 seats; the driver sits in the middle of the vehicle. Vehicle offers gasoline or diesel engines; it can run over 60 kilometers per hour at land, and 10 kilometers per hour in the water. 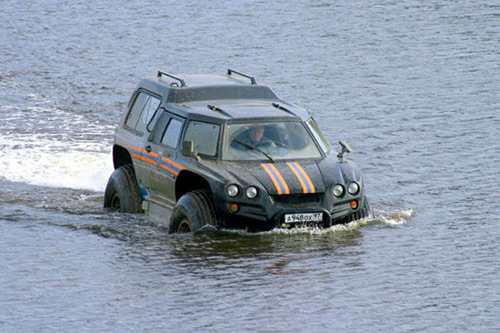 In contrast with most of the floating vehicles, on the water car is not powered by turning its huge tires, but it dispose of its own water-flow engine. Driving range of the Viking is 780 kilometers on the road, and 550 kilometers off the road. Payload 840 kilograms will allow taking enough equipment and reserves, or optionally more fuel tanks. Viking is very well prepared for any offroad driving. Overhand angle in front is 45 degrees, and 51 degrees at the rear. Turning diameter of this monster is unbelievable 8.6 meters. Viking is equipped with TORSEN limited slip differential, and the riding height can be controlled from driver’s seat, even during the ride. Weight of empty vehicle is only 1.4 tons, which makes it not just drivable with passenger car (B category) driving license, but it makes Viking very advantageous on the snow, sand and other powdery surfaces. Viking is not just the mean of transport. Vehicle cabin with centrally located driver’s seat is designed to be practical as much as possible. Viking can become mobile control room, lab, cottage, or multimedia center. If the list of optional equipment you can find turbocharged engine, hifi stereo, six speed gearbox and other luxury equipment. If you languish for the vehicle, which will survive the end of the world, and which is not in collection of every pop singer or oil baron, ask us about the Viking 2992.